8% increase in production with iVolve's Load Assist. Payload management plays a large role in meeting production requirements and keeping a fleet operating efficiently. With the upturn of the mining industry, many mine sites are moving their focus from large cost cutting methods towards increasing efficiency of their current operations. To assist with optimal loading of each truck, iVolve’s Load Assist displays load pass and total tonnage, BCM, material, location and centre-of-gravity data directly to excavator and truck operators via an in-cab screen. The purpose of this study was to assess operational payload performance on a site that had recently implemented iVolve’s Load Assist capability. Baseline payload management at site contained averages of 85% to 95% of target. 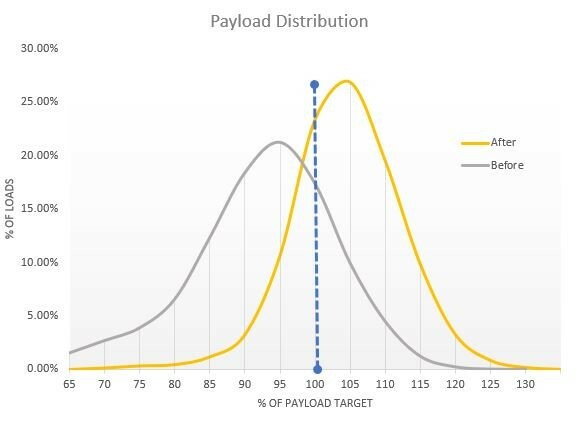 The graph above illustrates the payload distribution before and after iVolve installation. The data shows a much leaner curve with the majority of loads falling in the 10% range to target. Ten weeks after the iVolve installation, the payload was averaging at 103%, indicating an 8% increase in production. Using a truck and shovel costing model and the 8% increase in production, iVolve’s Load Assist had a return on investment, just one month after installation. For access to the full Case Study, please complete the form above.